Are you crazy enough to think you can change the world? 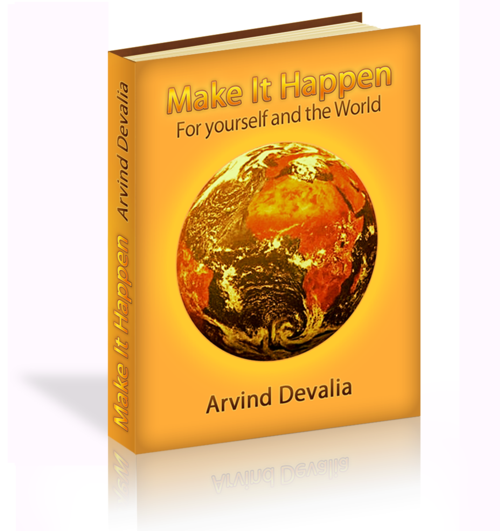 If so then you must read my “Make It Happen” manifesto. I am only looking for a few thousand people to read this ebook and between us we can literally change the world. I know this is a really bold claim but believe me if enough people read it and apply even a small bit of what it contains, the world will be a better place. And the people who adopt it will also be more fulfilled, happier and successful. Just imagine what YOU can offer the world through living your life to its full potential! My fondest wish for you is that you begin to live your life as fully as you possibly can from now onwards. And my book will help you do just that. At the same time, I believe that we are all ready to make a greater contribution to the world. Each and every one of us deep down wants to do something for the world. YOU can make a difference! What the world needs today is more people passionate about making the most of themselves and passionate about making a difference. Imagine living a life of being the best you can and also making a difference to others and leaving your mark in the world, no matter how small or big. Join me and others on this amazing journey ahead of us. Get my ebook and let us begin. If you already have an email subscription to Make It Happen and would like to receive the manifesto, please contact me here and I’ll make sure you get it. Thank you for joining me on this amazing journey – let’s all Make it Happen TOGETHER!